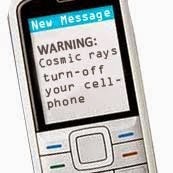 MANILA - A text message about "cosmic rays" and space radiation damaging your mobile phone is a hoax. Neither ABS-CBN's "Kuya Kim" Atienza nor BBC News have reported such a threat. What BBC has is a 2010 report on how gullible people in Ghana fell for false rumors about "cosmic rays" causing earthquakes when they hit the earth. I-off nyo mamaya lahat ng mga cellphones and gadgets 10:30pm until 3:30 in the morning kasi malakas ang radiation na dadaan sa mundo. Cosmic rays, nucli atomic ang tawag. Binalita ni kuya kim tsaka sa BBC News sa cable. Makakamatay daw, huwag itabi sa tulog ang cellphone. Please pass para ma-inform ung iba. The Daily Trend's Danley Rubica said a similar hoax happened in 2010 in the US. "One hoax news had recently spread these past days and this hoax is about cosmic rays from Mars that will hit Earth. This cosmic rays was rumored in the hoax that can cause high radiation in opened gadgets and it is added to the hoax that everyone mus turn off their gadgets starting 10:30pm up to 3:30am tomorrow. The hoax had spread all over the country thru text and was spammed all over other cellphone users," Rubica said. According to Coolbuster.net, similar hoax text messages are believed to have started in 2008. "The obvious intention is to cause panic, but criminals also use it to victimize people," the website explains. "Here's how the fraud goes: Once you turn off your phone, crooks will contact your loved ones and tell them that you met an accident. Because your phone is off, it will be impossible for your family, relatives, or friends to reach you and verify your condition. The criminals will then ask from them cellphone load or money. That's it," it adds.